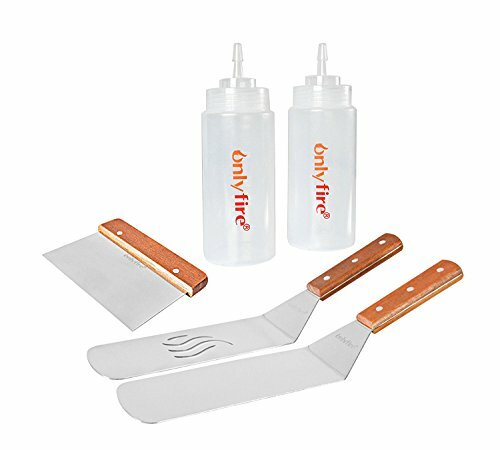 The scraper and spatulas are made of stainless-steel 304, comfortable nonslip rubber handle, The bottles are perfect for oil, water or your favorite sauce. The tool is comfortable to hold and work with, easy washing. This is the perfect addition to any backyard kitchen, a must have accessory. Great for cookouts, barbecue, caterers, tailgaters, campers and more. Comes with 1 chopper scrapper, 2 liquid dispensers, 2 professional grade spatulas. Chopper/scraper: to dice foods or scrape griddles clean. Spatulas: one perforated face spatula & one multi-functional solid face spatula, 2x6 inches. Liquid dispensers: each can hold 450g liquids of your choice to enhance your griddle cooking experience. A nice starter set for griddle use; Easy to Clean - Hand wash only with warm soap and water.